Since I blogged last week about the strange 1980 Fort McCoy UFO report I'm investigating for MUFON, more information has come up, so I thought I'd post an update. 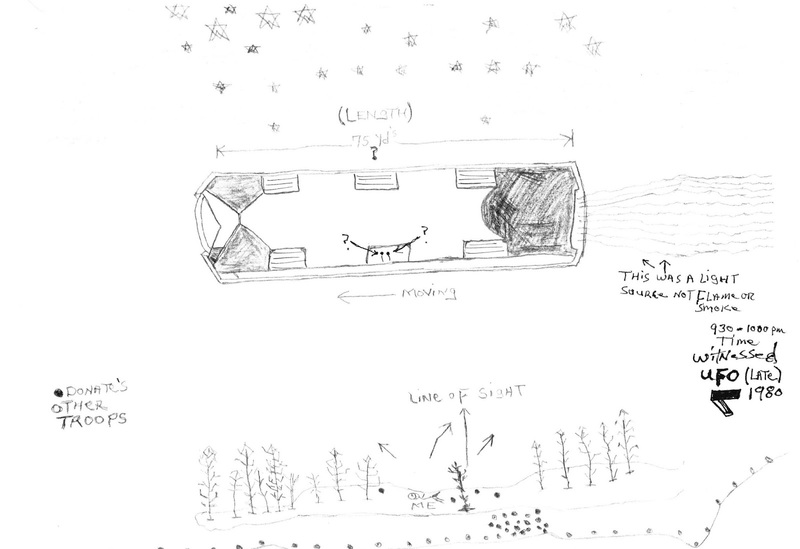 Fort McCoy UFO, as drawn by witness -- note the two tiny "occupants"
Your approach here does not put me in the mind of scientific inquiry. Lance, I'm not sure if you're commenting on my reportage in general or on some particular aspect of my narrative. I did say, before commenting on the witness' vocal cues and manner of speech, "Now I'm going to be very unscientific here and tell you what I found persuasive about this man's story..." Yes, I was being subjective in my observations. When I can hear stress in the witness' voice and sense the witness struggling for words to describe what he/she saw, I think it's reasonable to take that into consideration. In truth, that is very often the only thing I have to work with. In this case, while those cues certainly didn't prove anything, they did add to the witness' credibility in my eyes. And, as I mentioned, this case scored a very high 48.85 Certainty Rating on the Ballester-Guasp Evaluation tool, and the BGE is 100% objective. Did I miss the information or is there a date and time associated with this sighting. If you don't have these basic details, it is not a very good case at all. Tim, the witness does have a date and time, although after 35 years he admits he may be a little off on the date. In any case, it should be easy enough to date the presence of the Cuban refugees at Fort McCoy to get at least a rough time frame. So we have a date that the witness recalls but it may not be the precise date and time. If we don't have a precise date with a reasonably approximate time, it will be difficult to determine if what he saw was extraordinary or something ordinary that he misinterpreted. I doubt that any directions and elevations will be any more accurate. This is just another one of those UFO ghost stories that can't be verified or analyzed in any meaningful way. Okay, so... the witness reports that the event took place at about 9 or 10 p.m. on September 11, 1980, but, because this was an event that took place nearly 35 years ago, he can't be precisely sure of the date. That shouldn't be a huge surprise, but I don't understand Tim's attitude that without an exact time and date, the report is crap. And even if it "can't be verified or analyzed in any meaningful way," which I admit may be true, why is it not worthy of our attention? Sept. 7. Cuban refugees protested their confinement and future move to Fort Chaffee and tear down fence. That means that the witness and his comrades had to form their human fence on the 7th, which lends support to the witness dating the event on the 11th. And that's just the first piece of supporting evidence I've found. I may still find more. Finally, purrlgurrl, I want to address your doubts in my next post. You suggested that the witness may have had an intense dream experience, and that the behavior of his superiors suggests that they didn't see anything that night. The notes the witness sent me include more detail of what was going on at the base in general and with him in particular in the days, hours and minutes before and after the sighting, however, and I think the additional information is worth considering. I agree with Tim Printy that the uncertainty in the date and time of the sighting is problematic. That is especially true when checking for correlation with celestial phenomena, which is my area of interest. That said, it may still be possible to gain some insight into the case. The following report contains some information that tends to corroborate the non-UFO portion of the witness's story, and precisely constrains the period of his deployment at Ft. McCoy. It covers all of the military refugee processing centres, so care is required to ensure that a given section or passage is relevant to Ft. McCoy. In his MUFON CMS report (case #66867), the witness stated that he was in a unit from Ft. Carson, Colorado, that was sent to Ft. McCoy, Wisconsin. The above report reveals that this was the "1st Battalion (Mech), 12th Infantry, Fort Carson, Colo.," which "closed on Ft. McCoy on 27 August," and "... departed for its home station on 5 October ..." pg.195 (pdf 218). Assuming that "closed on" is synonymous with "arrived on", then that narrows his presence to Aug 27 - Oct 05. The witness also stated: "after we arrived at ft. mcoy the cuban refugees rioted and torn the compound down and my unit had to provide a show of force to preclude refugee escapes etc. .at one point the entire battalion had to physically man the the securityfence to contain any major disturbances." The report frequently cites Fort McCoy Daily SITREP's (situation reports) and Fort McCoy Daily Journals. These could be potential FOIA targets, though I doubt a UFO would have been considered noteworthy, especially given the gravity of the refugee situation. Also cited are the LaCrosse Tribune, Wisconsin State Journal, and Sparta Herald. The first and last of these are fairly close to Ft. McCoy. I could imagine them carrying a brief report of the re-entry. I could also imagine it difficult to locate decades old issues. 1. In which direction was the witness facing when he first spotted the UFO? 2. In which direction was the UFO when first seen? 3. In which direction was it moving? 4. What was its direction at the moment of the sketch? 5. Are the responses to these questions based on the witness's present recollection, or does he have a record that he refers to? If the latter, how long after the sighting was the record produced? Thanks for engaging Ted! I'll be writing more about this later today. Mark, I look forward to any additional information you may have. You will see in my comments that I inadvertently disclosed that the I am considering a re-entry hypothesis. It is too soon to decide. When sufficient details of the case become available to arrive at a preliminary finding (pro or con) I will provide a detailed report for your consideration. You lost me there. You're preparing a detailed report with a pro or con finding? For me? Some background information may be in order. I am an amateur astronomer with a special interest in observing artificial satellites and closely related subjects. Over the past three years I have been working to compile a history of sightings of re-entries. I found ~190 known cases, published in various books, journals and online media. Also, I identified ~60 more previously unknown sightings, nearly all of which were documented in UFO archives and journals. Most of those are obscure, long forgotten. Some aspects of the Ft. McCoy sighting are similar to the way in which re-entry and meteoric fireballs have been described. My interest in the case is to see whether it can add anything to my knowledge about re-entry sightings, specifically their visual appearance and how they are perceived. Much is already known about the phenomenon, but it makes sense to collect more data. Of course, first I must test the re-entry hypothesis against the evidence, then decide pro or con. The analysis consists mainly of identifying known re-entries that could correlate temporally and spatially with a suspected sighting. I may decide that a sighting probably was a re-entry, was not a re-entry, or that there is too little information to decide. I do this research primarily to satisfy my own curiosity. I have written reports on a few of the sightings I found most interesting, and hope to write more. I often share my findings with other researchers who I believe may have an interest. I am pleased to share those related to Ft. McCoy with you. We could very well come to different conclusions; I more interested in sharing information and ideas. When someone draws a picture of something they saw against the night sky and offers a measurement of that object (like 75 yards long), what does MUFON training suggest about such "data"? Lance, I don't have my MUFON Field Investigator's Manual handy, so I don't know what MUFON would say about it. I wouldn't (and didn't) call it "data," as it is obviously a best guess based on the witness' knowledge of the height and location of the trees behind which the object emerged and behind which it disappeared. Why do you call the witness' estimate "data?" Just curious.